The Environmental Health Team is responsible for enforcing health and safety legislation in many businesses in the Borough. The Health and Safety Executive (HSE) enforces this legislation in higher risk premises. Our enforcement complies with the standards promoted by the Better Regulation Delivery Office. We are fair and consistent when we take enforcement action and will take strong action including prosecution where there is a blatant disregard for the safety of employees and when it is in the public interest. Some accidents are reportable by law within strict timescales. The council has an obligation to investigate accidents. However, this may be through a very light touch if we believe that the business has done what they can to prevent injury. Workplace transport means any vehicle that is used in a work setting. It does not include transport on the public highway, air, rail or water transport as these are covered by other rules and regulations. 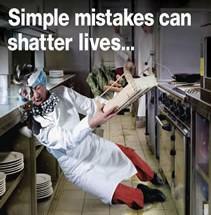 Workplace transport is the second biggest cause of accidents in the workplace and causes about 70 deaths each year. Most of these are preventable. Who Is on Your Register of Cooling Towers and Evaporative Condensers?